I have been struggling to understand exactly how increasing CO2 levels leads to global warming using basic physics, and the story is complex. The trapping of certain bands of infrared radiation emitted from the Earth by greenhouse gases is well known. The effective cross-section of CO2 of absorption for CO2 in its rotational bands is also well known (HITRAN). Using the current concentration of CO2 in the atmosphere it is also clear that essentially all the radiation emitted by the surface in these bands is already absorbed by CO2 at pre-industrial levels. 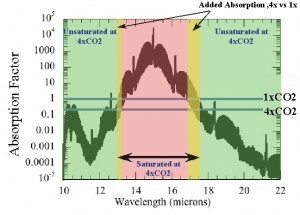 In fact spectra from space show that the main CO2 bands are saturated in the lower atmosphere with minimal emission from the high atmosphere. The absorption of radiation follows a logarithmic law with distance assuming a uniform concentration of CO2 in air. All that happens if you double the concentration of CO2 in air is that the absorption length is halved. So more radiant energy is absorbed and reflected back to earth at lower levels of the atmosphere than before. However the total energy balance would appear at first sight to be almost unchanged. In fact just such an experiment was performed by Herr. Koch and led Angstrom to dismiss theories of man induced warming already back in the early 20th century (Realclimate: what Angstrom didn’t know). 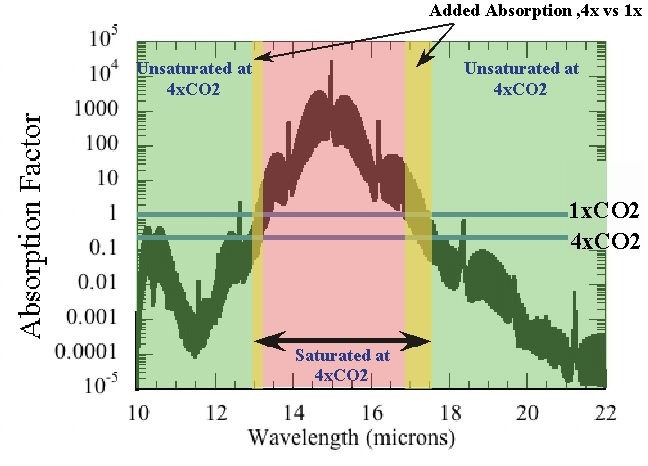 There are 3 main CO2 bands of IR absorption at wavelengths 1388, 667, 2349 cm-1 (HITRAN) and these are already saturated at current levels of CO2 in the atmosphere. Infra Red measurements from space show that the atmosphere is opaque at these wavelengths. However at high levels in the atmosphere this is not no longer true and this is the only argument for the enhanced greenhouse warming by CO2 warming which makes sense to me (see below). Spectra of solar radiation and outgoing Infrared radiation. Note CO2 absorption bands ref: Barry & Chorley. There is a very interesting paper here : http://brneurosci.org/co2.html which describes the basic physics. The absorption length for the existing concentration of CO2 is around 25 meters i.e. the distance to reduce the intensity by 1/e. All agree that direct IR radiation in the main CO2 bands is absorbed well below 1 km above the earth. Increasing levels of CO2 merely cause the absorption length to move closer to the surface. Doubling the amount of CO2 does not double the amount of global warming. Any increase could be at most logarithmic, and this is also generally agreed by all sides. Lab experiments using tubes filled with CO2 to represent the atmosphere show that the IR transmission is essentially saturated and doubling the amount changes the transmission very slightly . So what is wrong and how are these arguments refuted by the majority of climate scientists? There are two main arguments why global warming is important despite apparent saturation when man adds CO2 to the atmosphere (see Realclimate ). The first of these is rather convincing. 1. IR scatters repeatably upward through layers of the atmosphere until at between 5-9 km the air is so thin that the the atmosphere becomes transparent allowing CO2 emissions here to radiate out into space. At these levels there is little water vapour and CO2 dominates the energy loss. As CO2 concentrations increase so this level shifts to higher levels in the atmosphere since a critical density must be reached for the radiation to escape. These levels are colder (until we reach the troposphere) and IR loss is proportional to T**4 (Stefan Boltzman’s law). This means that slightly LESS energy is radiated to space than before and since the total energy must balance, the Earth warms up to radiate more heat to compensate. Don’t forget that there are windows in the IR spectrum with no absorption other than water vapour allows extra energy loss through evaporation and IR emission from clouds. Clouds also increase albedo. The vertical concentration of H2O and clouds are both temperature dependent. The temperature profile of the atmosphere is called the (adiabatic) lapse rate and is approximately -7 degrees per km falling to -4 degrees per km in the tropics. This is valid up to the Tropopause after which temperature rises again in the stratosphere. So greenhouse warming depends on falling temperature with height, and the anthropic enhanced greenhouse effect due to CO2 emissions is equal to the reduction of IR emissions to space in CO2 bands from the upper troposphere. 2. It is not completely true that the CO2 absorption bands are saturated as the fine structure is quite complex and in the side bands there is still energy left for the atmosphere to absorb. This is a much smaller effect than the first point. The extra absorption caused by an increase of a factor 4 is just a few percent as shown in the figure. In fact already 95% of the radiant energy is absorbed by CO2 at pre-industrial levels leaving a maximum of just 5% for any increase you like. It is often estimated that the CO2 green house warming component of the planet is about 3 degrees C so this extra absorption and emission to the surface would appear to only add just 0.15 degrees of warming. Therefore the main physics arguement supporting enhanced global warming caused by increasing levels of CO2 is the in height and thereby lower temperature of the effective radiating level of the atmosphere to space. The first comment to make is that we never hear this crucial explanation in the popular descriptions of the greenhouse effect. We just hear that more CO2 absorbs more heat radiated from the earth and radiates it back to the surface thereby heating us up just like a thicker blanket does in bed (blankets actually work by cutting down convection losses). However the real explanation above concerns just the outermost layers of the atmosphere. The enhanced greenhouse effect depends on a decreasing temperature gradient with height so that as the effective radiating level for IR by CO2 rises so the energy loss falls and the earth must rise in temperature to compensate. Energy balance demands that there is a perfect match between incoming solar energy and outgoing IR energy. So lets look at this in more detail. The effective temperature for all IR emissions is around -20 degrees C radiating at a height h of 5km. Now suppose that we double CO2 concentrations and the effective last radiating level rises to say 6 km. The temperature would now be about -27 degrees C as the decrease is almost linear in the troposphere. However the effective surface area is now also greater by an amount 8*PI*R (where R is radius of the Earth = 6350) making 1.6*10**5 sq km larger than at 5 km height. The IR radiation falls off with temperature as T**4 which gives us a reduction of about 18% relative to before. However if we just look at the main CO2 emission band and use the measurements from space (taken from Houghton’s book Global Warming – A complete Briefing). It would appear that the effective temperature of CO2 band alone is -53 degrees C which is almost at the tropopause ( -60 degrees). So with all else remaining the same (water vapour, methane etc.) the drop in energy loss is just 3% in that single band. CO2 causes the lower atmosphere to be opaque at the main absorption bands. The mean free path is only about 25 meters, so at these wavelengths the lower atmosphere is already like a thick fog where IR radiation is scattered in all directions. As we rise up in the atmosphere so the density falls exponentially and only at heights of 8-9 kms does the atmosphere then become transparent in the main CO2 bands allowing energy loss direct to space. Doubling concentration rises that level nearer to the tropopause which radiates at a lower temperature. The estimate given for the Earth’s warmng in Houghton’s book is 1.2 degrees for each doubling – so 2.4 degrees would be the heating if CO2 concentrations were to increase by a factor 4. These figures are based on a radiation reduction of 4 watts/meter**2 caused by this effect of the effective radiation level rising to a colder level. In his book Prof. Houghton says this can easily be proved, but I have not understood where this figure comes from nor how it has been calculated. The IPCC predictions of future warming are based on model assumptions of positive feedback effects which are supposed to result from the initial warming caused by CO2 emissions. The main feedback effect is that of increased evaporation of the oceans leading to an increased greenhouse effect of water vapour (already 80 – 90% of greenhouse effect). However it is known that cloud cover in general leads to a net cooling effect on the Earth by blocking incident solar radiation. An increase in cloud cover of 10% would be enough to cancel out global warming effcets of increased CO2 ( Barry & Chorley). Radiative Forcing Update: I have now found this reference to the equations used to derive the 4 watts/sq m radiative forcing by doubling the amount of CO2 in the atmosphere. Then we get simply 5.35*ln(2) = 3.7 watts/sq m for the radiative forcing of doubling CO2 ! If it is really true that this formula has been derived only by assuming that all “observed” temperature rise since 1750 is caused only by CO2 increases, then I fear this is a circular argument ! Many skeptics argue that the recent rises in temperature is dominated by a natural recovery from the little Ice Age. In order to be convinced that CO2 is the primary cause of recent warming then I would prefer that this formula could be derived from basic physical arguments rather than introducing a fudge factor preset to prove a theory. you can find a derivation of all necessary formulas from first priciples in every climate science primer. If we are talking about a photon of energy emitted by a CO2 molecule from say, 9000 meters, how does putting a CO2 molecule at 9100 meters, which absorbs and re-emits that photon, reduce the energy of that photon? The entire argument about ‘higher equals colder’ rests on kinetic to emissive energy change, such that a collision between a CO2 molecule and say an O2 molecule at 9100 m results in less CO2 stimulation than one at 9000 m. In this instance yes, the emitted photon will have less energy when emitted to space. But what would happen in the absence of that CO2 molecule at 9100 m? No energy would be emitted to space. This means the energy is kept in the atmosphere. So in case 1, a photon passed up a chain of CO2 molecules, the energy is the same when emitted to space. And in case 2, a kinetic->emmisive change and emission would not occur in the absence of the CO2 molecule. I think you’re missing the point. At higher altitudes, the photon emitted has a lower probability of being intercepted by a CO2 molecule, allowing it a higher probability to be radiated into space. As to the CO2 molecule at 9100 m. If it’s not there then the photon continues out into space. If it is there and doesn’t hit any other molecules it emits a photon a few milliseconds later — in a random direction. About equally likely to send a photon back down towards the earth as out into space. Thanks – This is by far the best clearest review of the greenhouse effect I have found. It is a great set of articles which describes energy balance and radiative transfer effects in the atmosphere. There is unfortunately no simple formula for the greenhouse effect, since the details of real calculations get complex quickly. Results rely on numerical analysis but confirm a direct warming of around 1.2 degrees for each successive doubling of CO2. What you’re seeing is that we really have warmed some – every thousand years we have a warm period. The Mycenaean, The Roman and the Medieval are over the last 4000 years. What this additional warming does is to move more heat into the stratosphere. From here it is radiated off into space from H20 and the other gases among them being CO2 which at the moment is only one out of every 2500 molecules – in total saturation in the lower atmosphere but in the stratosphere capable of radiating heat and reabsorbing heat exuding from the troposphere. Nothing complex going on here. What the additional warming appears to be from are the synchronization of the cyclic Milankovitch Cycles. Clive, the explanation you have given isn’t correct. The formula of dF = 5.35 ln(C/Co) isn’t worked out from existing climate change. When the “radiative transfer equations” are solved to give the value of “radiative forcing” for many different concentrations of CO2 and plotted out, this formula is simply a reasonable empirical fit. It has nothing to do with the actual temperature change and therefore isn’t a circular argument. Dietze paper has several other good links. is quite interesting and informative. 0.25 deg.K < sens. < 0.5 deg. values cited not too long ago. by the recent CO2 rise. “5.35 Ln(C/Co)” formula; it simply summarizes the data. We know that the Earth’s climate has survived many catastrophes in the past – yet maintained an environment suitable for life over eons. The idea that CO2 levels alone determine the temperature has become a sort of religion. Other more important mechanisms must be at work and it is obvious that the Oceans have to be the main stabilizing influence. Otherwise why did not the climate not run away after the last ice age as CO2 outgased from the warming oceans causing more global warming causing more outgasing? As Roy Spencer argues CO2 levels have for at least the last million years been an effect of climate change and not the cause ! Can the tail wag the Dog ? Well the IPCC supporters are obviously convinced the answer is yes ! The physics certainly supports a small warming effect of about 1 degree from a doubling of CO2 in the atmosphere, but this can be easily offset by small changes in humidity and cloud cover. These may also be driven by outside factors like cosmic ray intensity, solar wind and the sun’s magnetic field strength . “5.35 Ln C/Co ” formula? depict a cause and an effect? from the figure I just referred to? gets 2X values way lower than those of the IPCC. up a personal climate science library. 1 This figure is taken from http://www.realclimate.org/index.php/archives/2007/06/a-saturated-gassy-argument-part-ii/ – sorry – I should have referenced it directly. So the data is from what some skeptics call the “Hockey Team”. 2. This statement is based on the following: The main greenhouse gas n the atmosphere is water vapour and 75% of the Earth’s surface is covered in Ocean. Therefore water stabilises the climate and drives all weather. Assuming a total greenhouse effect (water + CO2) of about 20 degrees then the extra greenhouse warming component provided by CO2 (beyond water vapour) would be around 3 degree (10 – 20%). Adding CO2 to the atmosphere gives only a logarithmic increase to warming. Therefore, feedbacks excluded a doubling of CO2 will add only < 1 degree warming and a quadrupling of CO2 < 2 degrees warming. The whole IPCC argument which has mesmerised the world's politicians is based on the hypothesis, unsupported by measurements, that there is a positive feedback whereby small CO2 enhanced warming causes water to evaporate from the Oceans accelerating warming. However, if that was true then we would not be here today to discuss such esoteric issues, because life would have been snuffed out endless times in the past due to volcanic CO2 emissions or outgassing of CO2 after Ice Ages. 3. Houghton’s book from around 1995 “Global Warming: the complete briefing” is a very good objective summary of the early IPCC case, it became hijacked by politics. His book even accepts that the medieval warm period was much warmer than temperature found today when wine was grown in Yorkshire and the Danes settled and farmed in Greenland. the IPCC and by “realclimate.com”. citation, I don’t bother with it. willing to give “realscience” another chance. far as I am concerned, we are talking about how much man will influence the climate if CO2 doubles from its current level. (0.05) is the percent of atmospheric CO2 that is man caused. as being proportional to the widening. OK, again, I realize that that 0.01 deg. K is startlingly low. and alarmist seeming IPCC values. that all temperature change is man caused. “33 deg. K is the total greenhouse effect” Oh???? So, James, this would be a hot day? I was under the impression the moons average surface temperature was 0C. The difference in temp between earth’s surface and the top of earth’s atmosphere is 33 degrees. That’s the greenhouse effect’s contribution to earth’s warming. That is the average effect. At high latitudes in winter it is much less. That is the effect of gravity on the atmosphere. Gravity does work by compressing the atmosphere and because of the law of conservation of energy the potential energy is converted into thermal energy. Greenhouses have nothing to do with it. Without naturally occurring greenhouse gases, Earth’s average surface temperature would be near 0 degF instead of the much warmer 59 degF. Paradoxically, the top of the atmosphere would also be near 0 degF instead of the much cooler -59 degF. That is the effect of gravity on the atmosphere. Gravity does work by compressing the atmosphere, converting potential energy into thermal energy. This also gives the atmosphere a lapse rate of temperature, which distributes the thermal energy across the depth of the of air, from the warm surface layer to the coolest layer at the top. Thus, the atmosphere acts like an insulator and greenhouse gases have everything to with that. Heat is concentrated during the act of compressing a gas. The total energy within the gas does not increase due to compression. Once compressed, the overall temperature will decrease (or increase) to the ambient temperature unless acted upon externally. In short, simply “being” compressed does not make the atmosphere warm… just like compressing air into a tank will raise the temperature, but the heat dissipates over time until ambient temperature is reached. Greenhouse gasses effectively trap (temporarily) the heat from the sun, and from the surface (and below) and prevent immediate escape into the “ambient” temperature of space. Without greenhouse gasses, day/night temperature differential would be huge. Gravity does not “cause” a warm atmosphere. I am sure you are correct that the forcing caused by the tiny increase in IR radiation from the extra side bands in the CO2 spectra is very small. So your estimate of <0.1 degree rise for a doubling of CO2 looks reasonable to me. So this argument is a red herring. The argument as to why doubling CO2 causes warming relies on the upper atmosphere. The density falls off exponentially with height and temperature falls about 6.5 C per 1000 m up to the tropopause. At a certain density (height) most IR photons emitted by CO2 molecules at this height will leave the earth because there are so few CO2 molecules above them. This adds adds a small energy loss to the Earth;s energy balance. If the density of CO2 then doubles then we have to go a bit higher - (something like Ln(2)/slope) to reach the critical density again. But the temperature falls by a few degrees at this height so slightly less Energy is radiated (T**4). If less energy gets out into space then the eventually the surface warms up a little bit so that energy is balanced again. As far as I understand it this is AGW. I am sure it must be possible to get a reasonable estimate of this effect without writing a GCM model and solving radiative transfer equations etc - and I will try to do it. That said - the effect is generally agreed to be around 1 degree maximum. The alarmists however have tuned the models to include scary feedbacks to pump this up to 3-6 degrees. I think the evidence is now coming in that this is a gross exaggeration. Clearly there are vested interests in keeping the scare story going. Your statement above seems to imply that the 400ppm of CO2 emitting and absorbing photons in the top atmospheric layer represents some sort of gatekeeping effect. The upper atmosphere emits black body IR across a broad spectrum of wavelengths. There is no significant amount of water vapor at that altitude (http://laspace.lsu.edu/pacer/Experiment/2010/Flight_results/KC_Science_Presentation.pdf), so CO2 is the only thing left to capture any outgoing IR. CO2’s bands of absorption are not broad enough to make any significant difference in the loss of heat once water vapor is removed from the picture. 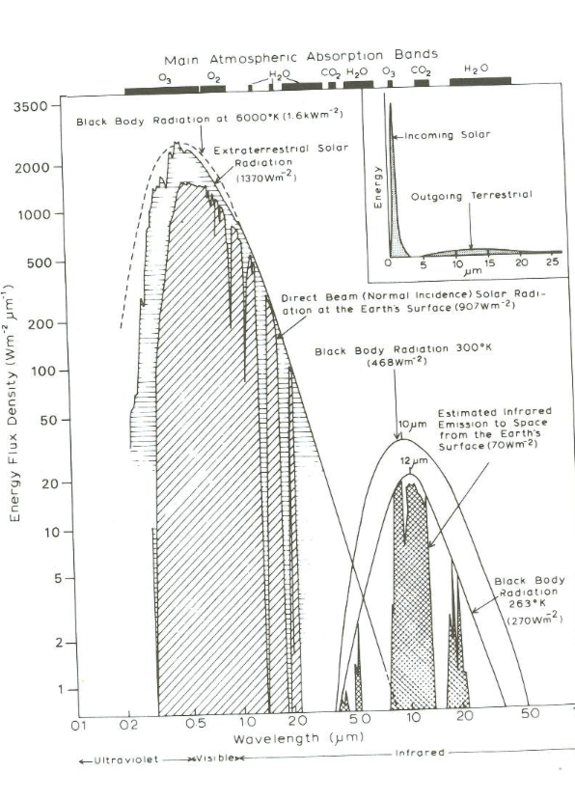 Any heat CO2 captures at or above that height would warm the surrounding air and increase the black body radiation of all of the components at that altitude, so the only net effect is a huge decrease of net emission in the CO2 absorption bands, with a corresponding increase across the remainder of the black body spectrum. in fact, that’s why satellites show the atmosphere as opaque for CO2 absorption bands, because the photon emission is insignificant compared to the black body radiation. If there were any significant observed temperature changes at any level of the atmosphere due to CO2, it would be front page news and there would be no need for climate hysterics to massage surface station temperature data. The upper atmosphere emits black body IR across a broad spectrum of wavelengths. That is not really true. At a given height the flux of IR upwards is equal to the sum of emissions from all levels below the given height including that directly from the surface, plus the emission from the given level upwards. The atmosphere itself can only radiate IR from greenhouse gasses – H2O, CO2 and Ozone. The rate of emission depends on the local temperature, and this rate for a given wavelength is determined by the Planck distribution for that temperature. This is usually called local thermodynamic equilibrium. How is the lapse rate maintained? What really happens is that radiative heating (absorption) from below for any given layer tends to increase the lapse rate away from the adiabatic lapse rate. This then increases convection to restore the lapse rate to the stable adiabatoc rate. Eventually there are so few absorbing molecules left that the lapse rate peters out. This is essentially the tropopause. It would indeed be very interesting to compare temperature soundings from the 1950s to those of today to see whether the tropopause has really increased in height as a result of higher CO2 concentrations ! Nitrogen and Oxygen are not magically exempt from emitting thermal radiation. ALL matter loses heat through thermal radiation. On first glance, that big opaque spot around 15 um looking down from space looks worrisome. But all it is showing is that the average temperature of the CO2 visible from space is much cooler than the average temperature of most all the other gases. So yes, there is heat being emitted by CO2 in the colder layers above those containing water vapor. I just don’t subscribe to the theory that this extra upper layer CO2 is driving a change in net outgoing energy. There is too much transfer of heat to other gases and therefore other outgoing wavelengths. Let’s not forget that the effects of water vapor are 100 times that of CO2. CO2 has been in or near total saturation from about 200 ppm. Whereas any time you add heat you increase the water vapor in the atmosphere on a water planet. The argument as to why doubling CO2 causes warming relies on the upper atmosphere. The density falls off exponentially with height and temperature falls about 6.5 C per 1000 m up to the tropopause. At a certain density (height) most IR photons emitted by CO2 molecules at this height will leave the earth because there are so few CO2 molecules above them. This adds adds a small energy loss to the Earth;s energy balance. If the density of CO2 then doubles then we have to go a bit higher – (something like Ln(2)/slope) to reach the critical density again. But the temperature falls by a few degrees at this height so slightly less Energy is radiated (T**4). If less energy gets out into space then the eventually the surface warms up a little bit so that energy is balanced again. Yes, I have seen this argument for increased CO2 impact before. altitude, cannot be more gone than gone. I will try to work that all out and get back to you. CO2 is as great as the original effect. somehow that 5% ref. does not come up. accumulated atmospheric CO2 is man caused? have 30% when the flux has only 5%? What am I missing here?…..
anthropogenic, i.e. due to burning fossil fuels. Mankind burning of fossil fuels has caused a 30% increase in CO2 concentration in the atmosphere since 1750.
the composition of the incoming flux? However all this does not mean that AGW is proved. An observed relatively minor increases in global temperatures of about 0.6 degrees are not proven to be caused by this increase in CO2 levels . This is still just a theory which needs experimental evidence. There are other drivers of climate apart from CO2 and climate feedbacks are unproven and could even be negative. “Although the human contribution to outgoing CO2 flux is small < 5% of natural outgoing, it would appear to be cumulative. " There is absolutely no such appearance. The statement is a bald lie. There is no physical evidence of this at all. says that it is mathematically impossible. as a steady stream of the mixture leaves the tank. The Earth doesn’t care from where a CO2 molecule originates. All that matters is how long it takes to reach equilibrium again if the amount exchanged between the biosphere and the atmosphere each year increases by a small amount. Left to itself the Earth would return to an equilibrium concentration say after a massive volcanic eruption. All that would happen is that vegetation and plancton would bloom in the medium term to absorb any small excess. The same is true of man made CO2 (provided we don’t tarmac over the planet). I’m still having trouble understanding this thing. I have read everything on the subject including Dr. Weart’s article. If we merely double CO2 concentrations, then the added CO2 will mix within the existing atmosphere. It does not seem like this added amount can make much of a difference in the point in the upper atmosphere where newly radiated infrared energy can escape? If this band did grow in height, then the argument stated would make sense? Does the air pressure at sea level change? What does make sense is that the added CO2 leads to additional thermal energy at the lower altitudes and this eventually mixes throughout the atmosphere. This energy is absorbed within lower altitude band. The fact that the entire atmosphere is opaque in these bands is not relevant to the process. The lower denser air gets warmer first. I agree that what really matters is whether the effective height in the atmosphere where IR radiation escapes into space is the crucial factor. It is always assumed that extra CO2 diffuses rapidly isotropically throughout the atmosphere. I also find this difficult to believe have not seen any data showing the actual increase of CO2 levels at different heights. Note also that this applies to H2O as well which is 70-90% of the Earth’s greenhouse effect. How water reacts to forcing from CO2 is crucial to the whole debate. Does extra evaporation lead to more clouds thereby increasing albedo ? Do more clouds produce more rain leading to lower H2O levels in the upper atmosphere ? If so then H2O feedback is negative and there will be just 0.2 to maximum 1 degree rise in temperature from a doubling of seasonal and CO2. One other interesting observation about CO2 is the almost instant response of seasonal and “anthropogenic” changes to CO2 globally. How can emissions from China be immediately observed at the South Pole. I think that the real reason for seasonal changes is the assymetry of water coverage between SH and NH. SH has 80% ocean and NH has <60%. SH summers also have 6% more solar radiation. This is more likely the cause of seasonal changes and long term CO2 levels are driven by Ocean dynamics. Thank you for reviewing these points. I am a firm believer that anthrogenic factors have given rise to much of the recent global increase in temperature. I am disappointed how virulent comments become when one asks to connect the dots on the global warming subject. I have been trying to understand the (large) attribution of the effect of CO2 on the forcing function for warming. I had to come to a similar conclusion that the widening of the absorption band for the higher concentration fell far short of the 1.5 W/m2 from the GISS NASA model as well as the 1.7-3.5 W/m2 as others have proposed. You struck a chord descibing the attribution as a circular argument. My inclination is that the CO2 concentration is a clear data set that shows the effect of industrialization, etc. The global temperature rise follows that rise with a reasonable correlation and the infrared absorption can plausibly describe an increase. My opinion (I know the expressions) is that a reasonable correlation can be drawn using the global population, the global power consumption (which contributes CO2), the world cattle population, etc in place of the CO2 concentration and come up with the same conclusions. My main concern is the treatment of CO2/greenhouse effect as THE explanation of the cause for global warming as dogma taught to all elementary school children by teachers who understand only the analogy with glass in a greenhouse. I fear the environmentmental engineering projects spending a great deal of effort and energy at carbon sequestration, etc having unintended consequences but having no effect on the temperature rise. I agree that the indoctrination of children that climate change is dangerous and caused by our evil lifestyle is unproductive. I was then able to derive the logarithmic dependency in the next post. I truly appreciate the effort you put into deriving this. I now see why I haven’t been able to get a satisfactory explanation–few individuals have the background and patience to explain this type of detail to lesser mortals. This type of educating goes much further than the “accept it because the consensus of climate scientists have already settled this” approach. I have a very hard time accepting science which not grounded in classical (or in this case, quantum) physics. I look forward to following your additional insights into other physical explanations of climate complexities. I have agraph which plots temperature increments against increments of CO2 in ppm starting at 20ppm and goes to 480 ppm with the temperature increments declining exponentially. Which means only the first 20ppm of CO2 has a significant affect. 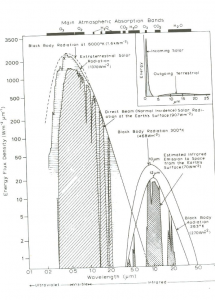 But have no idea where the graph originally came from I have an idea it’s a graph from an old NASA report in the 70s & 80s and has been reproduced elsewhere but not attributed. Anyone recognise it? Anthony Watts has a version of this bar chart on his page, Jo Nova on hers. Clive provides the data in the more conventional format. From simply the concentration of CO2, it is an easy point to make that the atmosphere is optically opaque to infrared at concentrations well below any historical levels.Therefore all the heat radiating from the surface of the earth is absorbed by the small amount of CO2 whether it is 200 or 300 or 600 ppm. The point is then made that additional CO2 does not contribute anything to warming the atmosphere. Unfortunately, as Clive has described, the effect of CO2 on warming is a consequence of the temperature gradient in the atmosphere. At the thin, outer layers of the atmosphere, the number of atoms in a given volume result in it being effectively transparent. As you go deeper into the atmosphere, the density rises to the point where it is effectively opaque at the CO2 infrared wavelengths. The CO2 in the atmosphere at this level would radiate out to space and below this level it would be absorbed or reflected within the atmosphere. The temperature of the atmosphere where this CO2 radiates its infrared outward is much cooler than the surface so Q_Rad? ? ?T^4 is less than it is at the higher temperatures at lower elevation. As the CO2 level increases the elevation of the “opaque” surface increases and the radiating energy drops. 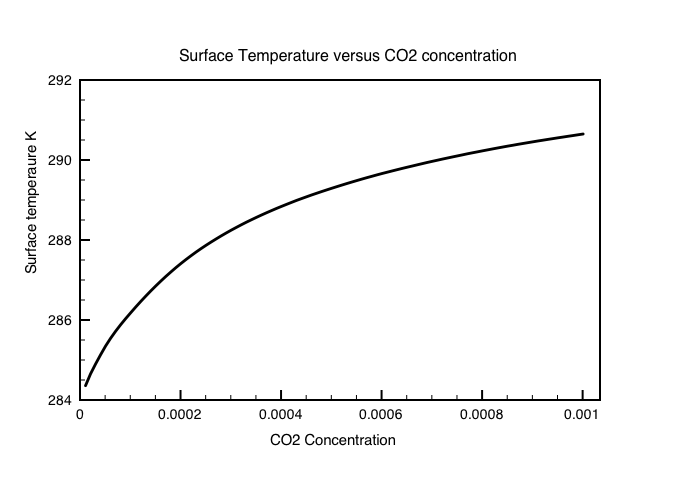 In the blog post referenced above, Clive describes the exact physics of the phenomenon which, in turn, can be converted into the plot of surface temperature versus concentration, below. Thank you Clive, and thank all of you who have commented. Everyone has noticed CO2 to temperature correlation throughout earth’s history. The question is cause, effect, or co-indicator and of course subtler feedbacks. I found a Watts per Sq M number ( the range I found was 1.5 – 2.5 ) retained heat from CO2 in the atmosphere. Use the number of your choice,, 510 billion square meters X 2.0 Watts per Sq M gives only 1.2 Trillion Watts of heat. 510 billion square meters X 4 Watts per Sq. M ( Clive’s number ) = 2.4 Trillion Watts. Heck, for that mater let us use 10 Watts per Sq. M. to make the math easy. 5.1 Trillion Watts of heat. Electricity is not the only hydrocarbon source of heat, and atmospheric CO2 is only an averaged indication of hydrocarbon use. I found some graphs. Offset and scale to your heart’s content, it is not the CO2 that warms the earth, it is the heat from burning the hydrocarbons. The heat produced by burning hydrocarbons would be offset by the fact that more sunlight will be absorbed by plants as the CO2 goes up, and the sugar production by plants is a cooling process. I’m not talking about transpiration by plants, I’m talking about how plants turn sunlight into sugar instead of heat, and as the biomass increases due to added CO2, the amount of sunlight / heat blocked by photosynthesis will increase. In a stable planet this would be the case, however there has simultaneously been a process of deforestation and desertification going on. Unless we know where the has been an increase or decrease in planetry biomass it is not safe to assume that this relationship holds. An oops. 1 km2 = 1 million m2. The 4 W/m2 is 2400 TW. I have not read all these comments, so possibly another has written what I now write here. Not to put too fine a point on it, but the statement that the effective radiating layer achieved by adding CO2 occurs at a higher and thus lower temperature is inconsistent with fundamental physics. The radiating layer is that layer that brings about equilibrium of the Earth’s output energy with the input solar energy. The input is defined by the Sun and its distance from the Earth, the Earth simply responds. The Earth’s effective radiating temperature is what it has to be to return the incoming solar energy to space, period. Computing the vertical structure of the Earth’s atmosphere from that statement is not a simple task that can be easily explained to a layman. Terms like ‘saturation’, optical depth, line formation, pressure broadening, and many more need to be understood and then appropriate physics models and then integrations over lines, one by one, etc. must be made and the radiative transfer followed through the atmosphere. Supposedly, such detailed calculations are made routinely with every climate model, but how accurately they are made is opaque, perhaps even to the modeler, who may himself not understand the details. After all, he is likely an expert on climate, not on spectroscopy. Reading this and dozens of others climate posts I think all can agree with W. H. Smith’s point above that “climate scientists” well served to have training in virtually every avenue of scientific pursuit to not get blindsided by unseen effects. Clive, as a science person I have some general points that I think other science people might be asking. Do most general circulation models funded today rely on CO2 sensitivity derived on the assumption that the atmospheric CO2 delta concentration from 1850 to present is solely and 100% (not 50%, or 150%) responsible for the 0.78 C rise in global mean surface temperature? If the answer to that is near yes, considering that all agree that additive CO2 has fast diminishing sensitivity (if not already negligible,) how can models be prediction more rise in the next 100 years than we saw in the last 150? If scientists are really expecting water vapor positive feedback to amplify warming on what hypotheses did or climate stabilize in past inter-glacial periods at current temperature or warmer by several degrees than present, rather than run away to a Venus. Some of these periods significantly gained CO2 after their warm stabilization and nevertheless cascaded back into glaciation with high CO2 that only slowly diminished thousands of years later. Isn’t it probable that paleo CO2 graph plots reflect diminished use of CO2 by life’s smaller habitable zone and cooler oceans higher saturation point shifting the CO2 equilibrium toward sinking into the sea until the reverse in warming? Does your reading suggest that modelers are taking into account that the Sun’s emission is more than twice the intensity of Earth’s since it only has half the time (daytime only) and one direction in which to emit. The Second Law forces the Earth’s emission to be more diffuse over the globe in direction and in time. Therefore, even though the Sun’s spectrum is less weighted in the IR than the Earth’s the intensity is likely close, which means the CO2 in the vapor free outer edge of the atmosphere CO2 could be blocking a lot of heat that otherwise would be penetrating further because CO2’s now higher opacity and thus thermal density means higher emissions at higher altitude knocked back into space. Do you agree with any of this physics? Also, if higher temp puts more vapor in the air there will not only be more clouds but they will be more transpiration of heat, and the vapor can absorb the CO2 heat and relay it out in lower IR frequencies that are CO2 transparent. Perhaps these feedbacks and others are what has saved life from frying in the last 2 billion years. Thanks for what you have done Clive. This is a short reply because I am in India right now. Models assume natural forcing is mostly insignificant except volcanoes, and that all net forcing since 1850 is anthropogenic. CO2 forcing is enhanced by ‘positive’ feedbacks mainly H2O and offset by aerosols. Amazingly these efts in the models cancel out to result in an essentially simple CO2 log forcing! Your analysis is very helpful. But – I want to question some specific text – and you can perhaps rewrite the sentence with other wording to help me better understand. I am completely lost. I assume that some part of the sentence or paragraph is missing. You are taking the effort to tell the reader not to forget some important point – but the point is lost, due to the sentence making no sense. What I really mean is that h2o concentration is determined by evaporation so it’s greenhouse effect is temp dependent as its vertical profile. In addition Cloud cover must depend on evaporation reducing albedo so the end result is complex and not included in models. Wording poor I agree. I woke up one morning a few months ago and realised that assumptions about CO2 and global warming could not be right. I reasoned that CO2 makes up a tiny fraction of the atmosphere and that the atmosphere is dwarfed by the oceans, so it is not possible for CO2 to have such an enormous effect. Imagine a gas mixture 80%N2, 20% O2 and 0.02%CO2. This would represent preindustrial levels of CO2. An increase in CO2 levels to 0.04%, still represents a very low concentration, particularly in comparison to water vapour which is estimated to be present at a concentration of about 2%. Finding objective information about climate and atmospheric heat has proved difficult, so I am grateful to everyone in this forum for contributions. The principles of physics hold, so now I can the science my students. There is a very simple problem with your math: it predicts warming in the stratosphere which is not happening. Our satellite measurements of the stratosphere are quite good over the past 25 years or so anyway. You do understand this is an empirical, and not a theoretical problem, don’t you? Nice discussion – without the acrimony and diatribes of many others! I have just read an Harris article, but do not know if it is the salient one. I agree that this is the sort of physics that is important and that understanding what happens to energy in the atmosphere is the crux, but would suggest that drawing conclusions from the outgoing spectrum is flawed. If I look at my bank balance, it tells me nothing about income or expenditure. Similarly analysing outgoing radiation tells me nothing about incoming radiation (which we know fluctuates), or how that radiation was changed before readmittance. I would love to see a complete energy audit of what happens to all energy coming to the earth and emanating from geophysical processes on the earth. Energy is mutable in systems, so energy of one wavelength once absorbed is often re-emitted in another wavelength e.g. microwave in infra red out. If anyone knows of analysis of this nature, I would love to read it. 1) The temperature at the surface of the earth increases. 2) Therefore, it takes a higher altitude to drop down to the same temperature as before CO2 was increased (assuming the same temperature gradient vs. altitude). 3) Since the temperature at the effective radiating level *has to stay the same* in equilibrium, the radiating level itself goes up. Effective radiating temperature in the upper atmosphere has to remain unchanged in the basic model, because in equilibrium, (radiation from sun) = (radiation from earth) = (radiation from effective radiating level) = all of these remain unchanged. I think the confusion arose because the original paper presenting this argument first mentioned the altitude increase of the radiating level *assuming an unchanged surface temperature* – of course in that case the radiating level temperature drops. But then the article goes on to explain that the temperature drop at the higher radiating altitude does not actually happen, since surface temperature increases. 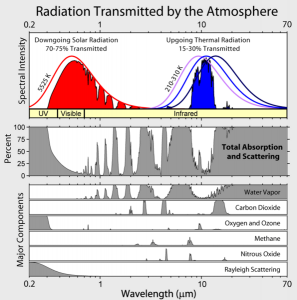 To summarize results of the basic model: CO2 concentration doubles through the atmosphere; surface temperature goes up, and the earth radiates more as a result; this extra radiation gets absorbed by the lower half of the troposphere; so in the upper section of the troposphere, nothing has changed temperature-wise – the effective radiating temperature is still the same in equilibrium since it has to compensate the constant amount coming in from the sun. Going back to your original post, I still find the first argument, why global warming is important despite apparent saturation when man adds CO2 to the atmosphere, extremely difficult to follow (although your statement of it is the clearest I’ve seen). You say “IR scatters repeatably upward through layers of the atmosphere”, but this is not “scattering” as the term is commonly understood in physics, i.e. Rayleigh or Mie scattering (which give us blue sky). Rather, it appears to be the following process. The re-emitted radiation then encounters another carbon dioxide molecule and the process is repeated multiple times. Is this right? In a secondary process, a carbon dioxide molecule, after it has absorbed an infrared photon and started vibrating, but before it has the chance to give up that energy by re-emission, may collide with another gas molecule, transferring the energy to it, in kinetic form, and raising the temperature of the gas. The body of gas, like all hot bodies, emits radiation, which increases with temperature. However, this is not the same phenomenon as direct re-emission by the carbon dioxide molecule. The extent of this secondary process is not clear, i.e. what proportion of infrared radiation is converted to kinetic energy of atmospheric gas molecules and what proportion is repeatedly converted into vibrational energy of carbon dioxide molecules. It is also not clear to what extent atmospheric temperature is attributable to direct absorption of infrared radiation coupled with collision, rather than by conduction and convection from the earth’s surface. In the following highly simplified model which disregards both repeated absorption and re-emission and collision, near infrared radiation from the sun cuts straight through the atmosphere (including carbon dioxide), hits the earth’s surface, and heats it up. The earth’s surface re-emits far infrared radiation – upwards only – which is absorbed by carbon dioxide, then re-emitted upwards and downwards. The upward component heads out into space; the downward component hits the earth’s surface again, heating it up further. It then re-emits far infrared radiation again – upwards only. The process is repeated multiple times (in theory, an infinite number). Each time, half the amount of radiation comes back down to earth, so there is a convergent geometric series. This earth’s surface is heated to an equilibrium temperature at which all the far infrared radiation, emitted by it, heads into space. The atmosphere is headed by conduction and convection from the earth’s surface. This seems a more plausible model than radiation suddenly reaching a critical height at which it can escape into space. That will be true when the earth temperature reaches equilibrium. My understanding is that the earth is not in energy equilibrium. It is warming up. Doesn’t that mean more energy is coming from sunlight than is going out as infrared radiation? Richard and Clive thanks for posts. Can anyone direct me to original papers about energy transfers in gas, particularly the atmosphere. At a basic level what happens to an energised gas molecule? How long does an individual molecule retain energy and how much of that energy is dissipated via collisions and how much radiated? If a CO2 molecule collides with an N2 molecule how much energy transfers to the N2 molecule and how is that transferred energy then dissipated? There must be half lives for energy retention. Does energy transferred to N2 then eventually radiate to space at a different frequency to CO2 frequency? My understanding is that in a gas energy principally transfers through collisions and only small proportions through radiation, so given the ratio of CO2 to N2 and O2 it would seem likely that most radiative energy absorbed by CO2 would quickly transfer to other molecules and ultimately be re-emitted in another wavelength? Another thought I have had since it has been such a cold May and June in Scotland is that since convection is the principal mechanism for energy transfers in the atmosphere, any heating in the lower atmosphere will be counter balanced by cold currents descending from the upper atmosphere. Rather than warming being a consequence of heating, more wind would be the effect? Is the earth getting windier? Sorry for being so uneducated, but sometime even a child can have a good idea. Regarding “Therefore the main physics argument supporting enhanced global warming caused by increasing levels of CO2 is the in height and thereby lower temperature of the effective radiating level of the atmosphere to space. The first comment to make is that we never hear this crucial explanation in the popular descriptions of the greenhouse effect. We just hear that more CO2 absorbs more heat radiated from the earth and radiates it back to the surface thereby heating us up just like a thicker blanket does in bed (blankets actually work by cutting down convection losses)”, yes, quite. That is, however, because those communicating with the public have concluded, probably correctly, that their knowledge of science and their capacity for focus is SO meager that the correction explanation would be lose of them. I know: That’s pathetic and wrong. But there are other, related fallacies which even some physicists and climate scientists get wrong, such as the “surface budget fallacy”. BTW, the best textbook I know which explains all this is Ray Pierrehumbert’s Principles of Planetary Climate, great for his mathematical and detailed explanations, his perspective of how this works on other solid bodies besides Earth, and his excellent set of Python code which can be used both to do his problem sets and do climate experiments yourself. I’ll quote from him (pages 413-414) on this, but I’d recommend getting the context, too. I have also inserted some words in square brackets to provide a bit more explanation. A common fallacy in thinking about the effect of doubled CO2 on climate is to assume that the additional greenhouse gas warms the surface by leaving the atmospheric temperature unchanged, but increasing the downward radiation into the surface by making the atmosphere a better infrared emitter. A corollary of this fallacy would be that increasing CO2 would not increase temperature of the lower atmosphere if the lower atmosphere is already essentially opaque in the infrared, as is nearly the case in the tropics today, owning to the high water vapor content of the boundary layer. This reasoning is faulty because increasing the CO2 concentration while holding the atmospheric temperature fixed reduces the OLR [“Outgoing Longwave Radiation”]. This throws the top-of-atmosphere budget out of balance, and the atmosphere must warm-up in order to restore [radiative] balance [due to the Blackbody Law]. The increased temperature of the whole troposphere increases all the energy fluxes into the surface, not just the radiative fluxes. Further, if one is in a regime where the surface fluxes tightly couple the surface temperatures to the overlying air temperature, there is no need to explicitly consider the surface balance in determining how much the surface warms. Surface and overlying atmosphere simply warm in concert, and the trop-of-atmosphere balance rules the roost. That last part is pertinent to the recent model-observations reconciliation based upon HadCRUT4. Ray also goes on to point out that Arrhenius got this all right, as did Callendar (1938) and Plass (1959), and then Manabe (1961). Ray does not point it out, but I will: Others did not, e.g., Knut Ångström. CORRECTION: Plass did not get it right. An outstanding article. It would appear to me to be very helpful to describe the radiative effect of additional 200 ppm CO2 or so based on the 5 W per m2, as a percentage of the roughly 350 W per m2 of incident solar radiation e.g. I believe this would be about 1%? or am I missing something? Many people have a feeling for percentages if not all the science behind global climate change and this may help a debate. If CO2 rises from 400ppm to 600ppm the increase in average radiative forcing would be about 2 W/m2. That is about the same as the energy density removed from the atmosphere by a wind farm. So as a percentage it is smaller than 1% and could be offset by a tiny increase in cloud cover. In that respect it is noticeable how the the largest cloud cover is over the warmest tropical oceans in summer months. The physics explanation is that tropospheric carbon dioxide heat blankets exponentially double in halving time increments. Blankets of +15 ppm, +30 ppm, and +60 ppm were added successively in +150, +70, and +40 years. The last 8-year 15ppm increment to >400ppm is at a level greater than in the last 2 million-years (Pieter Tans NOAA). The greenhouse effect is cumulative. Heat is trapped between the ocean surface and the tropospheric heat blankets. The 93% of manmade global warming in the surface ocean circulates in phase with 11-year solar cycles e.g. as in decadal oscillations such as El Nino Southern Oscillation. CO2 loads the gun; the solar cycle pulls the trigger. Since the millennium, the CO2 heat blanket effect dominates over the solar cycle heat input. Oceans are stratified with warm freshwater over cold salty water; heated from above, there is no convection. Wind-driven and geostrophic near-surface currents, in eleven counter-rotating ocean gyres, transport heat and nutrients polewards. At high latitudes, tropical-origin seawater basal melts floating ice. Freeze-brine carries cold salty water to abyssal depths. This is different from the ocean conveyor model. Heat sequestration in the tropics is driven by evaporation dependent on the Clausius-Clapeyron exponential function of skin temperature (increase about 7% per deg C). Land evaporation, dependent on windspeed and relative humidity, is mis-used in current climate models. On this basis, a recent peer-reviewed publication computed equatorial evaporation equal at midnight and midday! This is based on century-long daily sea surface temperature records. It was found on a student cruise between Tahiti and Hawaii where surface and 3m temperatures and salinities were measured hourly. A sign change in the seawater density equation reverses the impact of increasing salinity on density. By a quirk in the seawater density equation water warmer than 36 parts per thousand and 28C does not sink. It forms a westward thickening subsurface layer along the equator. It contributes to the 30C western and eastern Pacific warm pools. An Imperial College physicist with 50 years publication record has recently shown that Pacific warming was +3C in 2014 and likely +4C by 2016. Climate sensitivity is a nonsense. The doubling CO2 heat trap is also seen in the exponential doubling decrease in Arctic floating ice volumes. 1) doi: 10.13140/RG.2.1.2201.6169, or http://cirworld.org/journals/index.php/jap/article/view/4596/pdf_178 . 2) doi: 10.13140/RG.2.1.1415.1843, or http://cirworld.org/journals/index.php/jap/article/view/139jap/pdf_95. Let me point out that the amount of electromagnetic energy, whether incoming or outgoing, converted into atmospheric heating (next to the major portion which is via surface contact) is many orders of magnitude greater for H2O in the form of vapour or liquid than by CO2. The absorption bandwidth for a water droplet is, dependent on size, virtually continuous. As increasing earth temperature increases both forms of H2O, it is clear the greenhouse gas theory does not need CO2 to cause global warming! The fact is, earth’s temperature is stabilised by H2O the reason being that water droplets radiate energy according to the atmospheric temperature. Also, more water vapour means more cloud cover – and incidentally more reflection and re-radiation as well. Sorry folks, the climate is changing because urbanisation/industrialisation is draining the earth’s surface and reducing the production of vapour. It would be a start for the author here to recant the T^4 relation for CO2 emissions, or any dry atmospheric gas, – gases simply cannot radiate significant amounts spontaneously at atmospheric temperature. It would also add to the discussion to note that a blanket does not keep you warm in any way which is related to the atmosphere, it prevents the energy generated internally in the body from escaping by a thermal barrier, that is what raises bodily temperature. And to fit thermodynamics theory, energy is being temporarily displaced downwind from earth’s industrial belts so that when the polar region has got up to speed, the radiation balance will be restored – albeit with a man made pattern for the climate and some direct contribution from internal conversions – eg carbon and nuclear generators. But only for energy radiated by CO2. Energy radiated by all other gasses is from exactly the same level as before because we aren’t increasing the quantity of O2 and N2 in the atmosphere. Thus 0.004% of IR is radiated from a few hundred meters higher, 99.996% is radiated from exactly the same place. Hardly a significant change. Nitrogen and Oxygen are diatomic molecules whereas CO2, Ozone and H2O are triatomic. This changes the wavelength of the vibrational modes. CO2, H2O and O3 lie all within the thermal (planck) spectrum for earth temperatures whereas O2 and N2 are are much shorter wavelengths – typical of those on the surface of the sun. This means that CO2, H2O and O3 all get excited by thermal energy in the atmosphere compared to a tiny number of O2 and N2 molecules. They emit and absorb IR photons in thermal equilibrium with the surrounding air molecules. The temperature at a given height up to about 10,000 m is determined by thermodynamics – the adiabatic (moist) lapse rate and not by radiation. This scale is set by the surface temperature. The air thins out with height until IR photons emitted by H2O, CO2 or O3 can escape to space. This cools off the top of the troposphere and sets the scale. The earth remains approximately in energy balance so that the energy lost to space equals the absorbed incoming solar radiation. This effectively determines the temperature of the ‘top of the troposphere/atmosphere’ and equals 255K. The surface temperature approximately is then determined by the lapse rate. For the atmosphere to radiate from a higher altitude in general, due to an increase in the number of molecules in the atmosphere, its pressure would have gone up. Since this hasn’t happened I don’t see any validity in the suggestion. If the suggestion is that ‘because CO2 molecules are more numerous higher up’ that adding more is pushing only CO2 molecules to higher altitudes then my previous objection is valid. All mater above 0K emits heat energy, not just CO2, so 99.994% of the atmosphere is unaffected. Yeah, but “matter” does not emit energy at the same frequencies, and some of these would not conventionally be considered “heat”. But none the less the atmosphere emits upwards as a black body at all the frequencies you would expect of a black body at that temperature. Only some of those frequencies are impacted by CO2 so I believe what I say is valid; that either atmospheric pressure has gone up in line with the entire atmosphere emitting from a higher, and colder level, or it is only CO2 molecules that are now emitting from higher and colder levels, in which case any increase in heat retention must be relative to the increase in only CO2. @ConcernedCitizen: That’s precisely the point, as Clive explained. The broad absorption/emission band for CO2 at 667 per cm aligns almost perfectly with the main emissions for a blackbody in the range of Earth’s surface temperature. Not only does Earth not produce much in the absorption/emission regions for N2 and O2, but the incoming radiation from Sun is much higher in frequency and, so, CO2/H2O/CH4/O3 are transparent to it. Not so for the outgoing. And, also as Clive described, the only part of the atmosphere that radiates and dumps energy is the top. I don’t understand your reasoning regarding atmospheric pressure. Can you explain? The partial pressure of CO2 has gone up because we have emitted more, but it is such a small percentage of atmosphere that its effect upon atmospheric pressure is negligible compared to fluctuations in lapse rate and weather. My understanding of this theory is that by adding CO2 we have thickened the atmosphere, causing it to radiate from a higher, colder altitude. ie, increased the lapse rate, and causing a higher surface temperature. This would of course entail an increase in surface pressure. This hasn’t happened thus I see no validity in the theory. For instance, if the top of a square meter column of air rises, but the density of the air within it goes down, there is a way that can be done so that the total mass of the air in the column does not change, and so there would be no pressure change. So, y’need to add more specific details. I understand that Clive, I just don’t see how ‘CO2 radiating from a higher, colder, layer’ causes warming. If a photon emitted 9.9 kms is intercepted by a CO2 molecule 100 m higher up, and radiated again out to space, that photon hasn’t lost energy. The atmosphere hasn’t got thicker, so its not lapse rate argument either. I just don’t get it. Sorry if I am being dense, but I don’t see how this theory can be implemented physically other than by the entire atmosphere getting thicker. And it hasn’t. Sorry Clive, that doesn’t help. Maybe I am being a bit dense, but I just don’t see how having more CO2 molecules higher up means that less energy is emitted. 1) The CO2 molecule got hit by a photon emitted by another CO2 molecule. 2) It got hit physically by another molecule (kinetic to photon conversion). The energy in the second process is height dependent, the higher it occurs the less ke there is, but if the CO2 molecule wasn’t there that ke would stay in the system. CO2 is removing energy in this case, taking ke, converting it to a photon, and emitting it out to space. @ConcernedCitizen … Please record your physical justification “This would of course entail an increase in surface pressure”. I don’t see it. Moreover, it’s one thing to state such an expectation or derive it, and another to show that the change is physically detectable. As I wrote, there will be some pressure change due to increases in CO2, albeit small. OK, so then can you explain why CO2 is radiating from a higher altitude? Sure, because the per unit volume amount of CO2 over all the atmosphere is higher. In order for OLR to succeed in getting to space, there needs to be little CO2 above it. In other words, the increase in CO2 concentration makes the atmosphere more opaque to OLR. Accordingly, the emissive layer that succeeds is closer to the edge where there is no CO2. I still don’t get it. How does a photon, emitted by a CO2 molecule at say 9.9 km’s and being absorbed by a CO2 molecule at 10 kms (that wasn’t there previously) mean that photon has less energy? It depends on the wavelength (energy) of the photon. Most simply escape directly to space. Only a few in the central 15 micron line are absorbed by CO2 molecules higher up. None of this changes the temperature of the emitting layer which is dominated by the thermal energy of the surrounding air molecules. Eventually radiation loss to space becomes large enough to stop convection. That is the tropopause. ConcernedCitizen: It doesn’t. If you look at a single molecule absorbing and then emitting a photon. That’s not what happens in the lower atmosphere. There a CO2 molecule absorbs a photon, starts vibrating and crashes into other air molecules spreading out the energy. The temperature goes up. At higher temperatures more CO2 molecules emit infrared. At lower temperatures fewer do. If on average a given air volume absorbs more photons than it emits it must warm up. That’s my understanding of the greenhouse effect. Gasses emit infrared photons at energy levels set by the electron energy transitions for that chemical and vibrational state.The photon energy does not change. The number of photons emitted and thus the energy flux does. As to the CO2 molecule at 10 km up. Nothing says the emitted photon won’t get shot back towards the earth. I am not sure the about the source of confusion CC is experiencing. The top of atmosphere concept is elucidating for me. For IR wavelengths within the absorption (and transmission) bands, the atmosphere will attenuate the IR photons from the surface to space as a function of the concentration. CO2 is concentrated enough that the atmosphere would appear opaque. Looking from space the surface features of the earth would be obscured–the earth would look like a gaseous sphere. The intensity of the photons emitted from this TOA would correspond to the thermal energy determined using Planck’s Law. This is the only energy that can escape from earth to space of that wavelength. As the concentration of the emitting gas increases, the TOA is extended higher in the atmosphere. Thermal equilibrium at that altitude is at a lower temperature so less IR is transmitted. This is the idealized basis of the “greenhouse gas” effect. I think this is the only correct way to think about the GHE. Using this simple model I was able to calculated the radiative forcing of CO2, and understand the IR spectrum as measured from space. You migfht be interested in these posts. Convection and Latent heat drive the thermodynamics of heat loss from the surface and generate the lapse rate. Greenhouse gases just set the scale height of radiative cooling to space. Back radiation is a complete red herring which explains nothing. I think the co2 saturation story should be or could be the main scientific base to start a global campaing againts agw, if not too late. I am not strong enough scientificly to detect technical flaw to this thread. But if one could structure, debate, and win this hypothesus that doubling or even quadrupling co2 concentration in the atmosphere won’t change significantly its temperature that could be a game changer. Here in Québec our Prime Minister returned from Paris with totally new green policy, stopping any emerging oil exploration and full of new green taxing policy. I thing we can stop, or at least modify, the trend. But we must start with soud scientific arguments like I founb here. Almost all scientific paper I read take for granted ipcc co2 radiative forcing, witch is suspected to be originating from a circular processus. The way i proceed is examine arguments thoses whose views differ from ipcc one and try to judge at merit. Not an easy task, but quite interesting. Thank you for links reference. You don’t need IPCC, nor is that even the best. A good thing is to check out online courses, and textbooks. Two good ones are David Archer’s course on global warming, understanding the forecast, and, a more detailed, technical one (but you want technical details, right? ), Ray Pierrehumbert’s planetary climate book. The reason why CO2 forcing only grows logarithmically with concentration is because the central absorption lines are already saturated. These are spectra I calculated using this model. And, if you will recall, only half of the warming is CO2. The other half is from knock-on effects from water vapor, due to greater carrying capacity of atmosphere. I agree with you. This book is a masterpiece. I have it at home – but it is perhaps a bit heavy for your average punter. But people want to wade into this water, I don’t see how else. There is Archer’s book and course. Calculating CO2 forcing is not simple nor straightforward. But yes it has been done and the answer is known. Even then you have to make some assumptions such as a standard lapse rate. Feedbacks are a second order effect whose effects are not known. If they were then we could calculate equilibrium climate sensitivity (ECS), but we can’t. Instead we have to measure it and the margin of error on estimates hasn’t changed in 15 years. So no we don’t know that half the warming is CO2 and half is due to knock-on effects from water vapor. What about the umbrella effect? Increased CO2 and H2O as your own graph indicates also absorbs solar incident near IR from reaching the Earth’s surface. What is the cooling effect? Careful monitoring of CO2 around the familiar ~15 micron band already supposedly measures a .2 w/m^2 emission power increase per decade near the surface. Please note CO2 recently increases ~25-30ppm per decade, assuming the greatest forcing sensitivity a doubling of the current 400ppm should only lead to a 3.2 w/m^2 if the current ratio maintains. However, as you indicate there should be reduced sensitivity with increasing CO2, so the likely forcing should be less! Moreover, have you considered the reduction in incoming solar near IR. What is the reduction in measured 2-3 micron and or ~5 micron incident solar IR near the surface due to increases in CO2 throughout the upper atmosphere? What is the mutation in solar incident near IR at the Earth’s surface due to changes in atmospheric water vapor throughout the troposphere and to a small extent the stratosphere? Actually, with respect, work on cloud feedback has progressed a lot. The constant relative humidity assumption of prior work has been verified. And to the degree the basic model (back of the envelope one, not GCMs) fits the data, which it does pretty well, I call that a win. These values are wave NUMBERS, not wavelengths. The wave number of 667 corresponds to a wavelength of 15 microns. Stupid mistake. I should correct that. Thermdynamics states emissivity = absorption at every wavelength. Where there is no absorption there is NO emmission. Yes you’re right. Another imprecise statement! thanks. The heat of Venus and the climate on Venus may be understood if you consider the strength of the emr including gamma rays to be many times greater than earth because of its closeness to the sun. Then look at the slowness of the orbit. On earth near the equator a 48 hour day might cause temperatures above the boiling of water. On venus with a much stronger emr, the day is 243 times as long as ours. Some rocks actually boil. Because Venus is large enough to hold an atmosphere and half of the planet is not exposed to the sun, the enormous winds between hot and cold areas are created. Gamma rays and Xrays are absorbed by solids. The gases are a side effect. What gases absorb is irrelevant. Feel free to share the calculations that accompany your theory. What have you learned about the fudge factor? Is it derived from the cirular argument expressed above? No it is not a circular argument -I got that wrong. I finally ended up writing my own radiative transfer code to derive the greenhouse effect. I was then able to get about the same logarithmic result. see Radiative Forcing of CO2. So the formula is good. It does not necessarily follow. You must specify the mechanism by which the level shifts higher in the atmosphere. Shifting it higher in the atmosphere requires energy. If you say that energy comes from the increasing temperature, you are arguing something akin to pulling oneself into the air by one’s bootstraps. Moreover, it would be a positive feedback – increasing temperature, lofting the CO2 higher, increasing the temperature, and so on. Eventually, the CO2 would achieve escape velocity, and launch itself beyond Earthly influence. All that really says is that the density of air falls with height. So if CO2 as a percentage of air rises from 0.03% to 0.06% then the level at which it falls to the critical density to let IR photons escape to space also goes up. Density falls off exponentially so the height rises by something like log(2) or 60%. This is still an argument lacking a mechanism. Density alone does not provide height. If you took the Sun away, the entire atmosphere would collapse into a solid mass at the surface – very dense, in relative terms, but with hardly any height at all. You must have an energy source to sustain the particles at higher altitude. E.g., there is always a diurnal bulge in the atmosphere on the Sun side, centered close to the direction of the Sun (with some offset due to thermal inertia). The diurnal bulge is quite sensitive to solar activity, with the center of mass extending further outward by hundreds of km when solar activity is high (see figure 2.3 at link). The extra energy from the Sun is what sustains the atmosphere at those higher altitudes. When I said “with the center of mass extending…”, I meant it in a generic sense to indicate the peak of the distribution depicted in the figure cited. I probably should have said “center of area” to avoid potential confusion with actual mass concentration. Clive – thank you for spelling out the crux of the AGM argument (as I understand your explanation – a decrease in radiative energy loss with decreasing T as one goes higher in the atmosphere). What about the decrease in absorption that occurs as the temperature drops because of a reduction in doppler broadening (sharpening of the IR absorption band)? I am not qualified to comment but I found William Happer’s lecture where he cites spectroscopy experiments conducted using weather balloons very compelling. Clive, that “Radiative Forcing Update… reference” link has gone dead. It seems that one has to do the calculation to get a good appreciation of how sensitive the IR absorption is to [CO2]. I got frustrated and so I made up my own simple model (see appendix below). It is immediately clear from the solutions to the rate equations that the value of the reaction cross-section for IR absorption per molecule of CO2 is critical (as one might expect). By my estimates, for a cross-section of 10^^-23 m^^2, the IR photon loss to outer space is more-or-less saturated at very low levels of CO2 (~10 appm CO2 has an absorption efficiency of ~99% at 10-20 km). For a cross-section of 10^^-25 m^^2 the IR photon loss to outer space is more-or-less saturated at levels of CO2 that are similar in magnitude to the atmospheric levels. (~100 appm CO2 has an absorption efficiency of ~99%). It is clear that the absorption is not saturated in the wings of the absorption bands for increasingly smaller absorption cross-sections. There will be a range of cross-section values that are important from the perspective of additional photon absorption for the levels of [CO2] that are relevant to the atmosphere (I should determine that sometime). It could be that, in the freqency range where values of the CO2 absorption cross-sections are low enough that the absorption is unsaturated, the absorption cross-sections for water vapour are larger than those for CO2 – wouldn’t that be interesting? My problem is getting good, tabulated, cross-section data for the IR wavelengths of interest. Naturally, the IR absorption cross-section spectra will also vary with height in the atmosphere (temperature and pressure dependence) bur even values at STP will be useful for bounding the assessment problem. Can anyone point me to a good source of easily accessible tabulated cross-section data? where P2 is the number of CO2 molecules per m3, S is the cross-section for absorption, xg is the probability of re-emission and xgp is the probability of the photon energy being transferred to another gas molecule in the atmosphere (H2O, N2 or O2 mainly) and x is the distance in m. P0 and P1 are the numbers of photons that are free and bound respectively. Solution of these equations gives the number of free photons as a function of height. It is assumed that any photon that is free at 10-20 km is lost to outer space. I am not convinced about the black-body radiation argument: (a) can a gas be considered as a black body? (b) even if the argument was true, and photon emission was reduced at lower temperatures (higher in the atmosphere), absorption should also be lower for other reasons (e.g. less Doppler broadening). Being a failed physicist I would want to see some experimental data showing the effect of temperature on photon emission – does that exist? This is the correct approach that you describe. The cross-sections for CO2 absorption of IR have been measured and tabulated in the HITRAN database. The important ones on earth are the vibrational excitation quantum lines in the 15 micron band. I think the local thermodynamic equilibrium of the atmosphere is important because CO2 molecules can also be excited by collisions. So although air does not act as a black body, the IR emission of CO2 is temperature dependent and goes as T^4. Here is my simple picture. Incoming solar radiation heats the earth’s surface. The surface radiates as a black body at temperature Ts. The atmosphere consists mostly of diatomic molecules (N2, O2 Argon etc) and triatomic molecules (H20, CO2, O3). Only triatomic molecules have vibrational quantum excitation modes in the Infrared. H2O has a rather broad wavelength spectra whereas CO2 has just 3 main bands, but on earth only the 15 micron band is significant. Gravity generates an exponential falloff of density with height. H2O, CO2 and O3 absorb and reemit IR photons in local thermal equilibrium at the relevant height (Kirchoff’s law). By inhibiting the direct radiative heat loss from the surface to space, the atmosphere generates itself a lapse rate. This is because convection begins to move heat up through the lower atmosphere more efficiently than radiation. Only with a convective atmosphere under gravity can the greenhouse effect work. I once calculated the effective emission heights for CO2 using HITRAN, assuming a standard atmospheric lapse rate and profile. 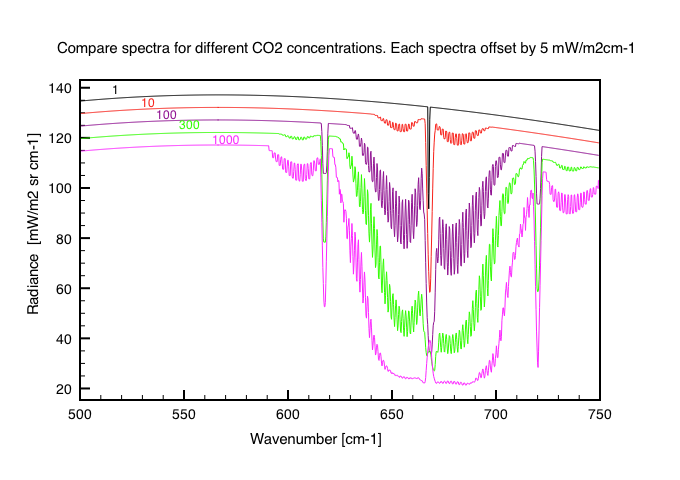 ( http://clivebest.com/blog/?p=4597 ) This is the resultant spectra I calculated for different concentrations for CO2. These actually get smeared out by pressure broadening. The central line cross-section is so high that it currently emits from the stratosphere where temperature increases with height. This means that this wavelength actually cools the planet with increasing CO2 levels. You can actually see this in Nimbus spectra. I’m a non scientist trying to understand exactly what CO2 actually does. You have helped a great deal, but I still have questions. As you stated, the absorption length for the current concentration of CO2 is around 25 meters. I’ve also read that almost all of the IR absorbed by CO2 is thermalized via collisions with nearby molecules, and is rarely re emitted (1 in a billion at sea level per Will Happer). So how does this relate to the “effective emission height ” scenario? It seems there would be very few photons left for CO2 to emit at such height if it’s all being thermalized very near the surface. What happens to the thermalized energy? I would guess convection and water vapor transport it upwards. If so, I don’t see this contributing to any warming. I understand that radiation is the only way for all this energy to exit to space. Surely CO2 at a very cold “effective emission height” is not able to do it all. Water vapor must be a major radiator. Why wouldn’t water vapor easily compensate for any diminished radiation caused by a higher CO2 emission height? Any help tying this all together would be appreciated. I think the trick is the following. So long as the earth (surface+atmosphere) loses heat through radiation to space the atmosphere will set up a lapse rate. This is because by far the easiest way to move heat upwards is through evaporation from the oceans and convection to where it can radiate freely. That is why we have thunderstorms and weather due to Coriolis forces. Net radiative losses occur at high latitudes to offset net absorption in the equator. As CO2 increases the tropopause should get higher. However, as you rightly say water vapour is the ace card. No-one really knows how clouds and H2O will play out. Clouds reduce albedo cooling the earth, whereas H2O (water vapour) enhances the greenhouse effect. My hunch is that water is the ultimate negative feedback because otherwise the oceans would have boiled away billions of years ago. I don’t think that is right. Kirchoff’s Law basically says that when a gas is being exposed to radiation following a temperature profile equal to the local temperature a local thermal equilibrium exists whereby the emissions at EVERY band are equal to the absorption rates at every band. I agree, however, that water transpiration, clouds and convection dominate the regulation of atmospheric temperature. The areas where there is little water vapor, like at the poles, deserts and the tropopause, then CO2 can have an amplified role. I think the idea here is that emission from the same excited state is rare (though I thought maybe 5%, not 1 in billion). There is still matching emission, but just from GHG in equilibrium with ambient, not matched to the particular absorption event. I don’t think that version of K is quite right. It says emissivity equals absorptivity. What is actually absorbed and emitted depends on incident intensity for absorption and temperature for emission. That sounds like what I tried to articulate. The emission profile is identical to the absorption profile when there is a local thermal equilibrium. Temperature, of course, is a measure of mean molecular kinetic energy. This is a property of the gas as a whole, not of a molecule. Whether one individual molecule is emits what it absorbs before interacting with other molecules I don’t see as relevant to the GHE, Kirchoff’s Law or anything else. The higher the gas pressure the more convection (collisions) will dominate over radiation to determine an instantaneous molecular state. Imagine a gas at 288K sealed within a perfectly insulated and infinitely thin balloon. Now transport the ballon into outer space. If the gas is argon then it will remain at 288K for ever. However, if the gas contains .03% CO2 then it will radiate ~15 micron photons according to Stefan-Boltzmann’s law until the gas ever more slowly cools to 3K. You are of course correct : “Forty-six lines between 0.69? and 1.80? are listed.” Luckily these are almost off-scale on a 288K black body spectrum! The walls of the building represent the Earth’s atmosphere. The outer surface is the top of the atmosphere and the inner surface is the atmosphere close to the Earth’s surface. Consider a building with modest insulation that is heated at a constant rate from inside. Assume that the building is insulated equally well everywhere resulting in a uniform temperature of the outer surface. In steady state there is a higher temperature inside the building compared to the fixed exterior temperature. The temperature at the outer wall surface is higher than the exterior temperature. The temperature at the inner wall surface is lower than the interior room temperature. These temperature differences maintain an export of heat at the same rate at which the interior is heated. If now the heat resistance (CO2) of the walls is instantaneously increased, at first the outer surface temperature drops and the inner surface temperature rises, while the interior temperature is still unchanged. In this situation less heat escapes from the building than is released by the indoor heating system. The imbalance leads to a slow ascent of the interior temperature that continues until the outer surface temperature returns to its original value. The initial cooling of the outer surface temperature is analogous to the quasi-instantaneous cooling that occurs in the upper half of the atmosphere. The cooling is only transient and has no permanent component. Assuming instead that there are parts of the building envelope that are more weakly insulated than the remainder, as is typically the case with thin glass windows. The outer surface temperature in equilibrium is higher at the windows than it is at the walls. A larger fraction of the total energy escapes via the windows compared to how much they contribute to the total area of the building envelope. Now, let the heat resistance (CO2) of the wall envelope increase. The outer surface temperature of the wall is again diminished instantly. But once in the new equilibrium, even more energy escapes through the windows and less through the walls. The permanent cooling of the outer surface temperature of the walls is analogous to the cooling in the higher atmosphere. An insulated building undergoing heating illustrates the blocking effect of CO2-induced mid to upper atmospheric cooling. The separation between walls and windows physically is analogous to the separation into opaque and transparent radiation bands spectrally, and energy transfer as heat conduction in the walls of a building is analogous to radiation in the atmosphere. since the reference linked no longer exists (“authors have deleted the site”). If you cannot find another source with the same equation, and since the one you cited no longer exists, then what basis for the equation you cited can you use to substantiate its validity and foundation? BTW, I’ve found over the years that in climate science referenced links many sites seem to have been taken down. I have thus since then stored (on my computer) the actual authors, their university or research institutes, dates of information provided and the basis of references the authors use. Though more time consuming and tedious on my part I at least have my original source to refer to if data (or basis) is questioned or if I find future reason to question or compare it with other sources I find later. There’s more than enough junk science and junk cleverly disguised as science on the web, even from established universities. .. one in particular but there are others I’ve found…. crackpot scientists promoting their own theories with foundations that are either actually just circular arguments or well known physics equations used out of context…. which most readers, even scientists won’t catch necessarily unless scrutinizing the series of multiple equations spread over several pages of “reports” carefully (fine tooth comb). of the atmosphere is extremely cold while the earth’s surface is quite warm. Good points, except I think the lapse rate is 3.57 degrees per 1,000 feet gain in altitude. indeed, other factors bring it down to 3.57. i was referring to the immediate adiabatic response which is closer to 5.6. Not really, if it doesn’t, the temperature will warm, that’s all. I’m being pedantic, but a lot of climate science has rested on assuming equilibrium, and there is none unless you average, and then you lose your signal. I think it arose from the helpful assumptions of steady state which are useful for fast processes, but I really think for climate it is the beginning of the ‘averaging’ disease that leads people to see simple solutions to preposterously complex problems as being plausible. Climate is a long term average of many short term cyclical processes and that makes it hard to assign cause to effect. WR: Clive, is that number of ’25 meters’ correct for CO2? Is there a source for the length of the free path for (other) re-radiating gases, for example H2O? And what should the free path be (for CO2 and H2O) at a height of – let’s say – 5 kilometer? H2O is more complicated and there is a wide band of emission frequencies. It is a much more effective greenhouse gas, but most water vapour is in the lower atmosphere. There is also the complexity of evaporation (latent heat), cloud formation etc. Water vapour also changes the lapse rate reducing CO2 greenhouse effect. The full effects of H2O on the climate are still not fully understood ! Because of the high density of water vapor at surface level, the free path for water vapor must be much shorter. I would be interested to know the free path for a photon in relation to water vapor molecules for the humid tropics, the Arctic and the Arctic and also for the world’s average. Could you estimate what the free path for a photon at the surface would be before it is absorbed by water vapor for the above mentioned four cases: humid tropics, Arctic, Antarctica and ‘world average’? I am very interested in the answer. The mean free path of CO2 molecules at STP is measured to be about 5.6×10?8m. Where are you getting 25 meters from? The mean free path of CO2 molecules at STP is measured to be about 5.6×10-8m, which 56 nm. Where are you getting 25 meters from? I really mean the mean free path of photons emitted by CO2 molecules – not their collision mean free path ! The mean free path of such photons varies by orders of magnitude with each emission line. The only correct way is to treat each line separately. Looking at Beer-Lamberts law it looks like the average is 1.5m rather than 25m. I can’t honestly remember where I picked up the figure of 25m from ! Raymond Pierrehumbert is the real expert. I even bought his book ‘Principals of Planetary Climate’. Clive …. great presentation, like it, though IMO, no one will ever be able to solve climate using radiative physics. Based on just “what is”, it is obvious that the GHG theory has very little to do with surface temperature, and more to do with energy stored in the system, having no Warming effect at all, but serving as a reservoir of energy in the absence solar insulation. Hence, the hottest temperatures are found in the areas of the least amount of overall GHG concentration, and in areas of high humidity, day time highs are actually lower. In essence, GHG actually take energy out of the system and store it during day time heating and return it to the system during night time cooling, decreasing the range of temperatures. This spreads temperature changes out over time and space. GHG works just like the ocean, but on shorter time scales, …. the ocean absorbs heat and stores it for long periods of time, whereas, GHGs having a much smaller heat holding capacity act in shorter time frames. Both the ocean and GHGs move stored energy around, primarily toward the North Pole, and apparently less so towards the South Pole, given the lack of warming in Antarctica. The overall impact of CO2 is limited by the total amount of energy available. The amount of IR in the CO2 spectrum is limited. Even if some of it is reradiated back to the surface, that radiation will be transformed to the overall spectrum of the surface, thus capping the actual amount of energy available for CO2 to absorb. As you say, there is already more CO2 than is necessary to hold this energy, …. adding more CO2 just dilutes the effect …. kinda like adding ice cubes to a pot of hot water …. the heat is distributed, and the temp actually goes down. Physics would like to belief that the radiative in/out must be balanced at all times, but this is simply false, because there are just too many heat sinks on earth, and the cloud feedback serves to ensure that the amount of energy absorbed never stays the same. heat is distributed, and the temp actually goes down? locally, yes. global average, no. Ted, IMO, globally is a meaningless term with regards to climate. All temperature graphs, surface based, satellite based, balloon based, doesn’t matter, … show that the so called “global warming” is in reality just arctic warming. Arctic Warming is due to a lot of things, influx of warm water, influx of warm air, cyclonic activity breaking up ice, blowing it out of the arctic to warmer latitudes, decreased ice allows more heat to escape from the water warming the air and less ice lowers albedo. What it is NOT driving Arctic Warming is CO2. A parallel effect of CO2 is global, global greening. When we look at global greening, we find that the entire globe is indeed greening. Thus, the CO2 fertilizing effect of CO2 is confirmed in the greening data. In contrast, we are told that CO2 operates on temperature via radiation, and as such it would be expected that it would operate the same globally. However, as mentioned, we do not see “global” warming, but rather we see that a specific region drives the global average. Thus the warming is not global. This is a major issue, IMO opinion. The presentation of the mechanism of GHG Warming would according to physics, operate the same everywhere, implying the entire globe is warming. This is accompanied by all kinds of carastrophy stories, dying penguins, drowning polar bears, species going extinct everywhere. But the fact is, the entire globe is not warming, just the average temperature is being driven up by arctic warming. From a physics perspective, the equation will have to account for a large number of heat sinks that act as capacitors. The Sun shines, but the majority of that energy is not available for immediate outward radiation. The different heat storage mechanisms, oceans, GHG, biomass, kinetic energy, ice etc, breath on their own time frames, and in order to accurately model the energy flux, one has to be able to accurately determine if a sink is taking in energy or releasing it. Some of those sinks are chaotic, and thus it is impossible to predict. I don’t think any of the models are remotely close to modeling the various heat fluxes within the system ….. and they fail. CO2 is but a small participant in this system compare the overall heat capacity of all atmospheric CO2 to the other sinks, and ya have to wonder how anyone comes to the conclusion that CO2 is a major player. (2) Any warming (at the surface) always leads to activation of cooling processes. Cooling processes tend to diminish any initial warming effect. (3) In case of a measured warming all (!) other potential sources of warming must be excluded before conclusions can be drawn about a temperature effect of absorbing / re-radiating gases. Ted, yes, greenhouse gases absorb and emit energy. No disagreement. However, the impact on global surface temperature is a different story. CO2 radiation onto a water surface (70% of earth surface) results in either evaporation or storage of heat into the system, the surface temperature need not change at all. Further, as that energy is absorbed, it is transformed to the black body spectrum, thus converting the energy specific to CO2 into energy that is no longer within the CO2 range, no different from SW when it strikes the surface. OLW measurements clearly show a cause effect relationship between SST and OLW. SST is impacted by the interplay of clouds, sun, and the oceans own behavior such as PDO, AMO, El Niño, etc., has nothing to do with CO2. I agree with you on all those points. Obviously IR from the sky does not have a sustained effect on surface temperature on a short time scale like one minute or one hour, or maybe not even one day. The blaring question is at what time scale does GHG IR start showing up in the rise in average temperature? one month, one year? Somehow that heat put into the huge buffer of the atmosphere translates into global warming, possibly a small amount…over a very long time scale. But perhaps that small amount is capable of setting off all those other triggers that could result in rapid global warming and climate change. To me, it is kind of like asking the question…how many times do you have stir the cream in the coffee until it finally mixes in? But SST would not be as warm on average without CO2 in the atmosphere. And overall global warming may indeed affect PDO, etc. Warmed by sunlight, Earth’s land and ocean surfaces continuously radiate thermal infrared energy (heat). Unlike oxygen or nitrogen, greenhouse gases absorb that heat and release it gradually over time, like bricks in a fireplace after the fire goes out. Without this natural greenhouse effect, Earth’s average annual temperature would be below freezing instead of close to 60°F. I don’t think this is correct. My understanding is that if a CO2 molecule absorbs a photon of energy, 99.999?? ?% of the time, that energy is converted to kinetic energy via collision with oxygen and nitrogen molecules. This is because the average collision time ( in the dense atmosphere near the earth’s surface ) is orders of magnitude shorter than the relaxation time of an exited CO2 molecular. At the tropopause, radiative energy release becomes dominant because of the much thinner atmosphere means fewer collisions and much longer average time before a collision occurs. How do excited Ñ2 and O2 molecules release energy? Do they emit photos of lower energy? If so do we measure the full energy efflux from the planet, or just concentrate on IR? Only a small amount of the energy from the sun is IR, the rest is more energetic radiation that gets absorbed by molecules and eventually by energy transfers is released as heat. Does the planet radiate more microwave energy than in the past? Much of what you say is true. However, the million dollar question is – How does the lapse rate get maintained? The answer is that it can only be maintained because heat is lost to space from the ‘top of the atmosphere’ by IR radiation. In effect the atmosphere is a huge heat engine moving heat from the surface via convection and evaporation up to colder layers where it then radiates into space. Convection slows at night and during the polar winter it stops. IR emission and absorption by CO2 molecules far below the emission height is unimportant compared to convection and thermal equilibrium through collisions. Each level in the atmosphere is in local thermodynamic equilibrium at the local temperature. 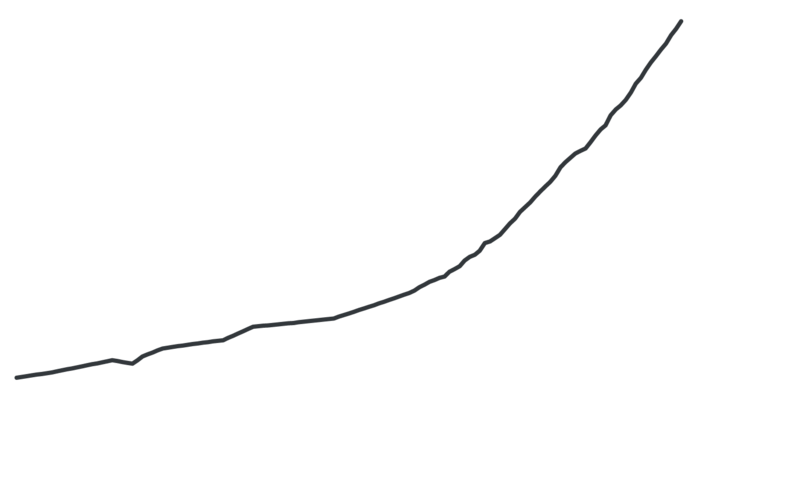 The rate of CO2 emission follows Stefan Boltzmann’s law at the local temperature. I agree the “global” average environmental lapse rate would increase and tend towards adiabatic as convection and evaporation affect more and more volume of the atmosphere world-wide. But beneath each volume (column) of additionally mixed air there is a surface area of the earth that has warmed up to drive the mixing. The more surface area warmed, the greater the global average temperature. Thus doubling of CO2 increases the area of surface heating and mixing globally and thus the increase the global average surface temperature, as we have measured over the past 100 years, and especially the last two decades. The rise in the emission height is actually an indicator of the convection. Greater area and depth (volume) of the atmosphere is getting mixed. I appreciate all your articles, programs and graphs. Very informative. You do good work. Opps, i meant -Clive Best. “What happened to the idea that most of the IR absorbed by C02 is re-emitted? I’ve read several physicists who show that absorbed IR energy is almost always converted to kinetic energy via collision with oxygen and nitrogen molecules. They vary somewhat is their calculations of average collision time and average relaxation time, but the bottom line is always the same: at sea level, the probability of an exited CO2 molecule emitting a photon is minuscule. Q: So, after a CO2 (or H2O) molecule absorbs a 15 micron IR photon, about 99.9999999% of the time it will give up its energy by collision with another gas molecule, not by re-emission of another photon. Is that true (assuming that I counted the right number of nines)? Q: In other words, the very widely repeated description of GHG molecules absorbing infrared photons and then re-emitting them in random directions is only correct for about one absorbed photon in a billion. True? So who is right, Will Happer and other physicists, or the “back radiation” explanation of the GHE seen in most pro AGW websites (and the above mentioned You Tube videos)? CO2 absorbs IR and warms. CO2 warms N2 and O2 through collisions. CO2, N2 and O2 emit some IR in all directions. And so on to the grand emission height. So you are correct in saying that it is not just CO2 that radiates IR in all directions (and in very small amounts). All the gases do! But it is CO2 at each level that repeats the process of absorption, vibration and re-radiation. The net effect is the same…the column in the sky emits IR back to the earth and warms it. The AGW are not incorrect in identifying GHG as the cause of back radiation. The slowness of radiative decay does not change the net result. As always I am left wondering why CO2. Warming that has been observed on this planet has progressed with industrialisation, but CO2 is not the only thing that has changed and not the only potential driver of warming. At a theoretical level CO2 could be causing an effect, but like all bad experiments, we have more than one uncontrolled variable and we may be looking at the least important because we are unable to sort wheat from chaff. Less than half of this radiation heads earthwards since it is above the horizon. Most of it will be absorbed or reflected on its way down by greenhouse gases, particularly water. 69% of the planet is on average covered in cloud ( so I have read) and where there is no cloud, there are water molecules and other greenhouse gases. What is the probability of a low energy photon reaching the earth’s surface having traversed this crowd of obstructions? Heat from Human industry. This heat is primarily produced in urban environments. It is generally emitted along with other emissions – smoke stacks, car exists, factory outlets… A fair degree of this heat become trapped in the smog and is back radiating well past sunset. Clouds trap some of this energy and radiate it at night. This energy, carried in clouds, drifts from above the city taking heat to other places. There is therefore a dampened release of heat and this particularly elevates nocturnal temperature when normal temperature lows occur. Buildings and roads both absorb substantial amounts of heat during the day and cool down at a slower rate than other parts of the environment. This then elevates night time temperatures, particularly in the period after sunset. In 1850 the majority of people on the planet lived in rural environments and metalled roads were few. The population, if I remember, was about 1bn, it is now 7.5bn with more than half living in cities. Roads are black, absorb considerable amount of heat and slowly release it at night. City buildings do the same. This leads to a dampening of nocturnal cooling and the heat emitted is absorbed by and refleced back by clouds. Again this will work to raise temperature lows and hence average temperature. I don’t know if the calculations have been done, but I suspect that if someone has the time, they will find that the heatsink capacity of urbanisation and roads now outstrips that of CO2 in the atmosphere. That is why I thought Clive analysis of Australian temperature was fascinating, since it shows that minimum temperature is higher. This is what you would expect it a heatsink was affecting night time temperatures. So a CO2 molecule will raise the temperature (vibrations) of surrounding molecules and consequently cause a little connection. Of course in the upper atmosphere, collisions are rarer and emission may predominate there. But, poor little photon has a long way to go if it choose to head down. It has to go through armies of greenhouse gases, particularly water if it has any chance of reaching the surface. In Scotland where I live I have noticed that the climate is milder then when I was a child. I have not noticed warmer summers, but winters are milder and night temperature are less cold. Is this caused by CO2 or other factors associated with industrialisation, population growth and urbanisation? Or nothing to do with humans at all? The picture that “back IR radiation” from CO2 molecules in the atmosphere is warming the surface is in my opinion simply wrong. Heat always flows from the surface upwards through the atmosphere to space. A simple picture is that doubling CO2 increases the height of the tropopause. The surface apparently warms a bit because the height of the lapse rate increases. The temperature at the ‘top of the atmosphere’ remains the same. Studies have demonstrated clear evidence of an increase in tropopause height with a decrease in tropopause temperature and pressure since 1980. That does support the notion that the tropospheric mixing is extending the lapse rate higher, which infers a higher global avearge surface temperature. I don’t understand your “back radiation from CO2”. There is obviously measurable IR coming from the sky. It is not just from CO2 as I explained earlier. It is IR emission from all gases in the optical depth of the whole atmospheric column. As the column fills with more GHG, this IR increases. At the risk of using an analogy…which while helping to grasp a concept but at the same time ignores essential details, I suggest this. The IR from the sky above a certain location is like a very long vertically standing flashlight loaded with batteries. We can detect the heat from the lamp at the surface. The lower batteries are very strong (charged) due to absorption by GHG and reheating of the non-ghg gases though vibration/collision. The upper batteries get progressively weaker but still contribute to the brightness of the flashlight lamp. Their contribution increases as the atmosphere warms and thickens and the tropopause rises and cools. The upper batteries increase in charge as GHG is added (or perhaps more weak batteries are added to the upper end of the flashlight tube). WR: To be able to leave the atmosphere (= the Earth) photons must have a free path to space which means that a photon will not be intercepted by an absorbing molecule during it’s way to space. Hence my question: the 4000m CO2 emission peak as mentioned above, is that a theoretical peak (for example in a modelled atmosphere without H2O) or are the calculations for the reality of the Earth’s atmosphere (with intercepting molecules like H2O)? For example Fig. 5b from http://clivebest.com/blog/?p=4597 suggests a much higher emissivity height than 4000 meter. Besides, as I understand, the free path for a photon at the surface is some tenths of meters or even much less. As the density of the air at 4000m has not diminished dramatically and the main absorbing gas H2O also is not absent, I wander how there could be such a long free path (even to space) for by CO2 radiated photons, already at 4000m. There is that which happens between photon and molecule and that which happens between molecule and molecule. Radiation coming from all directions and radiation being emitted in all directions. All this happens in microseconds and at best frequency. I think it is a bit like has laws where you can’t know anything specific, but where you have to rely on a statistic for velocity e.g. Root mean square. On average is energy taking longer to leave the planet as a consequence of greenhouse gases? Are these gases having a small insulating effect? There seems to be evidence that this happens, but if this is the case the shift to a new equilibrium for any concentration should be established immediately and if the effect is like insulation, there should be a diminishing return, so that a doubling of concentration does not double the insulation. This is just my way of visualising at the moment and I’m sure that a physicist who knows much better than me will shoot me down in flames almost immediately. Atmospheric insulation is not like material insulation (blanket, fiberglass, foam, etc). Whereas material insulation is of fixed thickness and air is trapped, the atmosphere has varying thickness (in response to any kind of heating) and is free to mix. Also, whereas material insulation is of fixed composition, atmospheric composition can be changed (ie the addition of GHG). And apparently, the atmospheric insulator’s R value goes up linearly with increase in temperature (see link in previous response). So it is not just adding GHG insulation that is increasing the greenhouse effect, warming and thickening of the atmosphere itself may be increasing the greenhouse effect…a positive feedback. While you can measure IR radiation in any direction the flux downwards is IMHO irrelevant because the atmosphere cat any height if in thermodynamic equilibrium mainly the through M-B kinetics. So the temperature is more dependent on thermal equilibrium than any heating effect from layers above. I can’t believe that anyone has tracked an individual photon, so presumably we are talking about a statistical photon, the average path which allows for collisions and emissions? Satellite measurements confirm less long wave radiation is escaping to space at carbon dioxide absorptive wavelengths. Surface measurements find more long wave radiation returning back to Earth at these same wavelengths. The result of this energy imbalance is the accumulation of heat over the last 40 years. Apparently the downward flux is cumulative over long time and space scales. I don’t think trying to track the real time path of IR photons will help explain the GHE. It’s like scale analysis…one can only write a relevant equation if the variables operate on the same scale of magnitude. When a UV photon interacts with ozone, work is done and IR is emitted. How do we know that the heat coming down towards the earth is emitted by CO2 and not the result of some other process? Over the period since 1850 the earth’s magnetic field has been weakening. A consequence of this is that there is increased penetration of high energy photos smashing into molecules and creating heat. I read a couple of papers on this some time ago and they had calculated that all the excess heat that we experience could be a consequence of this. I’ll try to find the references. I think it is the overall process of UV photons splitting oxygen to form ozone which maintains the ozone layer. Thereafter Ozone acts both as a greenhouse gas to block upwelling IR photons and as a sun block to UV photons. So it is a balance between GHE and albedo. The result seems to be that IR wins out – see a nimbus spectrum . In order for the Earth’s temperature to remain constant, the outgoing energy radiated by the planet and its atmosphere must equal the incoming energy from the sun that is absorbed by the planet. To balance the present incoming energy, the planet must radiate to space an amount of energy equivalent to the emission from a black body at 255 K. Since the surface of the planet is, on the average, at about 288 K, it emits too much energy to maintain the energy balance. The observed emission spectrum shows that the IR-absorbing gases in the atmosphere reduce the temperatures at which emissions to space occur. This lowers the effective emission temperature of the planet and maintains its energy balance. The planet can only do this by having an atmosphere that is compressible and in hydrostatic balance, resulting in the observed lapse rate of temperature. The “255K” is not relevant to Earth’s actual emission to space. The surface emits based on temperature. Greenhouse gases absorb heat. They then radiate this heat. Some of the heat will head away from the Earth, some of it will be absorbed by another greenhouse gas molecule, and some of it will wind up back at the planet’s surface again. But what is heat in this context? And where does this heat actually cause temperature increase? I believe the heat is simply longwave IR radiation. Sure greenhouse gases vibrate when they absorb IR, but since they immediately re-emit IR, they do not heat up in the sense of temperature. Nor do their vibrations cause an increase in temperature in other gases by collision, as the IR is re-emitted much faster the rate of collision. So, air does not directly warm up because of greenhouse gas (GHG) absorption at a given altitude. So then, how does earth and its atmosphere warm up from all that re-emitted heat? It is simply the net downward flux of IR heat being absorbed by the surface. The surface then warms up by vibration and conduction. The air takes in this heat through conduction, buoyancy, convection, turbulent mixing and wind which ultimately warms the rest atmosphere, establishing the average lapse rate. The natural net downward flux is about 5% of the incoming solar energy, resulting in an average surface temperature that is 60 deg F warmer than it would be if the air had no greenhouse gasses. But as we add more GHG, higher concentrations are mixed through the depth of the atmosphere (as well as across the globe). This increases the optical depth of GHG resulting in an increase in downward net flux reaching the surface, giving rise to average global temperature through the mixing process described. oddly though, the absorption of IR by ghg does not directly warm the atmosphere. the IR that is returned to the earth’s surface through optical depth warms the surface which then warms the air through conduction, convection and advection, i.e. weather. case in point, when you turn on an IR lamp, your skin is what warms up, not the air. this needs to be better explained to convince everyone what the heck is going on! I do not have the patience to read all the comments on this blog but just mention some things which often seem to get overlooked. At low heights, when a green house molecule such as co2 absorbs an infrared photon as a quantised vibrational state, it typically releases that stored energy by collision because the mean time to re-emission is greater than the time to collide with another atmospheric molecule. The greenhouse gas molecule is then in in thermal equilibrium with the atmosphere. At high altitudes, the low temperature is a measure of the low velocity of the molecule which combines with the greater distance that the molecule has to travel in the sparse atmosphere to have a collision. This increased mean-time between collisions means that the excited atom loses its energy preferably by emission rather than collision. This emission is random in direction so some infrared photons head back to earth. Ultimately the energy balance of the earth against solar radiation is determined at the top of the atmosphere rather than the bottom. I hope this is helpful and apologise to those who may have already made this point. Hello, I’m a collage student. Can I ask some question about carbon dioxide in atmosphere? First, In my measurement using FTIR, the integral area under spectra line is different of pure CO2 (0.3torr) and CO2 (about 0.3torr) in atmosphere. Next, I also mix Nitrogen (760torr) and pure CO2 (0.3torr). The absorption strength (area under spectra line) is (atmosphere > mixing nitrogen > pure CO2). But according to Beer’s law, they should be the same. It’s the effect of collision bordering or others you may know? Second, for Hitran, When they determine line intensity ( area under spectra line), do they use pure sample or sample gas in atmosphere? Because according to my measurement using FTIR, I find that the area seem to be different between pure CO2 and CO2 in atmosphere. Thank you !! These are excellent questions and I am not sure I know all the answers! Certainly in the real atmosphere CO2 lines are pressure broadened due to collisions with air molecules mainly Nitrogen but also oxygen and water vapour. So if you simulated the real atmosphere then you should get the same result. However it is complicated because temperature and pressure fall with height so you would get different spectra at different heights. So a measurement of ‘Back IR’ looking upwards from the surface would depend on the mean free path of IR photons for a given frequency. So they are more similar to the energy levels of Hydrogen or more complex atoms. So they are not equivalent to those measured in the atmosphere. When I calculate line intensity of Hitran, I use integral area “A” (area under spectra line) and Beer’s law “A”=sigma*density(n/cm^3)*optical path (cm). This sigma values is the line intensity. Is that right? However, I calculate pure 0.3 torr CO2. The area of 2313.3 cm-1 is about 0.02. Thus, line intensity is 1.72E-20. But Hitran give us 6.21E-19. Are there some steps I ignore during calculation? Thank you ! !